The Peak District National Park is the area contained within The Peak District National Park boundary. The Peak District National Park covers parts of Cheshire, Derbyshire, Staffordshire, South Yorkshire and West Yorkshire. The Peak District lies at the southern end of the Pennines and is divided into two distinct areas: The sparsely populated Dark Peak to the north where the landscape is mainly desolate moorland on gritstone and the White Peak to the south where the villages, hamlets, pasture and farmland lie on a limestone base. On 17th April 1951, The Peak District became the first National Park to be created in the UK and on 24th April 1965 became home to the start of the first official Long Distance Path or National Trail, The Pennine Way, which begins its long, lonely 257* mile journey north from Edale. This was due in no small part to The Kinder Trespass in 1932. Back then, such open moors like the Derbyshire Peaks were closed to all but the landed gentry who used them for just 12 days a year for sport. 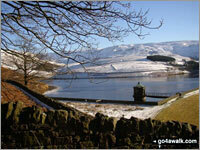 *See GPS Waypoints for Walking The Pennine Way from Edale to Kirk Yetholm for more details. The main places to go walking from in The Peak District are: Alstonefield, Bowden Bridge, Castleton, Crowden, Derwent Reservoir, Dovestone Reservoir, Edale, Hartington, Hayfield, Hope, Ladybower Reservoir, Longnor, Mappleton (aka Mapleton) and Milldale. There are 97 classified Mountains, Fells, Peak, Tops and Hills that lie within the boundary of The Peak District National Park National Park. All are within the capabilities of an averagely fit walker, hiker or rambler. To make your peak bagging records easier to manage, we have divided The Peak District National Park into two distinct areas which are listed below. If you want to see all 97 classified Mountains, Fells, Peak, Tops and Hills in one go see The Whole of The Peak District National Park but please bear in mind that the page may take a few extra seconds to load due to the amount of data being downloaded to your computer. Kinder Scout, Bleaklow, Black Hill . . .
Shining Tor, Shutlingsloe, The Roaches . . .
Kinder Scout, Bleaklow, Black Hill, Shining Tor, Shutlingsloe, The Roaches . . .